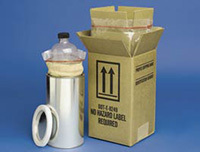 Our superior DOT-SP-8249 exempt packaging system enables you to transport liquid and solid toxic/poison materials in complete safety. This packaging is so effective in eliminating risk that the D.O.T. has authorized its use in transporting such hazardous materials without the "Toxic/Poison" label. Package #2 and #2A come complete as single-pack sets. Exterior cartons are available for shipping two or four single-packs together. When shipping liquids, pyrophoric solids or dangerous when wet materials, package #2 (liquid pack) must be used.